As a reward and thank you for their hard work, I planned a “Working Mans Feast” for Saturday night: baby back pork ribs, corn-on-the-cob, green beans, and a frozen lemony dessert. Everything turned out FABULOUSLY (if I do say so myself.) (Well, except for the “fake meat” I was going to make for the vegetarian in the group… that’s a story for another time.) Everything else was absolutely delicious! Combine rosemary, 2 tablespoons brown sugar, 2 tablespoons balsamic vinegar, and cayenne pepper. Mince garlic, add 1 teaspoon of salt to it & mash with the side of a chef knife (or mash with mortar and pestle). Add garlic to mixture with 1/2 tablespoon kosher salt and 1/2 teaspoon pepper; mix. Rub marinade evenly over ribs and transfer to a storage container. Marinate in refrigerator for 8-24 hours. Preheat the oven to 425 degrees. Arrange the ribs in a large roasting pan & pour a 1/2 cup water into the bottom. Cover tightly with foil & roast the ribs until the meat is very tender, about 1 3/4 hours (or until a knife slides right through the meat). Remove from oven and transfer to a platter. Add 1/2 cup of water to the pan (if necessary) and use a spoon to scrape up all of the brown bits. Strain liquid into a measuring cup and skim off the fat. Transfer to a skillet or sauce pan and add a 1/2 cup balsamic vinegar and 1/4 cup brown sugar. Bring the mixture to a boil and gently simmer until reduced to about 1 cup, about 15 minutes. Heat the grill on medium. Brush glaze over both sides of the ribs and grill and turn occasionally until grill marks appear (about 6 minutes). (Be careful, the glaze is very flammable!) Brush ribs with more glaze and serve. Serves 4-5. Mmm, mmm. Finger lickin’ good! I’ve always been one to say “if it ain’t chocolate, it ain’t dessert!”, but I think I’m going to eat my words. This may just be my new favourite dessert. 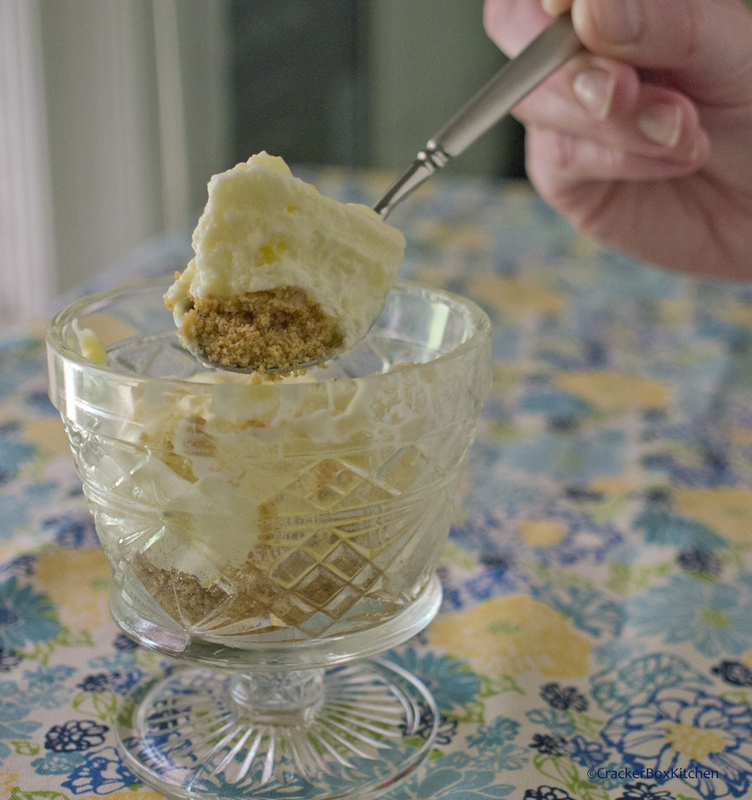 Combine 1 cup of the crushed graham crackers with the melted butter, stirring until a crumbly loose mixture forms. Line the bottom of an 8×8-inch pan with the mixture. Gently fold (don’t “mix”) lemon mixture, eggs whites and whipped cream together. Spread the mixture in the pan over graham cracker crust. Sprinkle with the remaining 1/4 cup of crushed crackers. Place in freezer for at least 3 hours (over night is even better). I promise (!) this is the best lemon dessert you will ever taste. The perfect cool and refreshing treat for a warm summer night. Watch a video of T digging himself a hole! Looks good! A fence is on my Honey Do List too! Ugh, thanks for reminding me.